Due to their intense color, balanced flavor and unique texture, blueberries are my favorite fruit for baking and when it comes to baking you can’t beat a buckle. If you look “buckle” up in a decent dictionary, right after the bit about the thing at the end of a belt, you’ll see the verb form: “to bend, warp, bulge or collapse.” Read on and you may find: “an early American form of coffee cake, usually baked with fresh fruit.” Although I may be a loyal cobbler fan, I think it’s high time Americans rediscover the art of the buckle. Heat the oven to 375 degrees F. Spray a 9-inch square GLASS baking dish with nonstick cooking spray and set aside. Whisk the flour, baking powder, salt and ginger together in a medium bowl and set aside. Beat together the butter and sugar in a stand mixer fitted with the paddle attachment on medium speed until light and fluffy, approximately 1 minute. Reduce the speed a bit and thoroughly incorporate the egg. Reduce the speed to low (or "stir" on a Kitchenaid) and add one-third of the flour mixture. Once incorporated, add one-third of the milk then repeat alternating until all ingredients are combined. Gently stir in the blueberries and pour the mixture into the prepared baking dish and sprinkle on the topping mixture. Bake on the middle rack of the oven for 45 minutes, or until golden. Cool for 30 minutes before serving. There’s a discrepancy between the butter used in your Blueberry Buckle recipe on your own website here, vs. the food network website (half the butter called for here), and the question is: which is correct? This is the best bake ever. I baked this when I was an early baker and it came out perfect. It has an unforgettable taste! Thank you Alton Brown for the creation! Easy recipe. Very moist. I made it twice but the second time I added a tsp of vanilla and omitted the ginger. I didn’t care for the ginger favor with the blueberries. This recipe is a keeper! I have neither a stand mixer nor a way to weigh ingredients. Can I use my hand mixer and standard measurements ? Would love to try this recipe. Have made this “Making of the Buckle” a Christmas morning tradition, it always turns out great. I make a lemon drizzle for a little extra kick. thanks Alton for all your awesome recipies. I’ve tried several coffee cake recipes from All Recipes, Taste of Home and they were not very good. 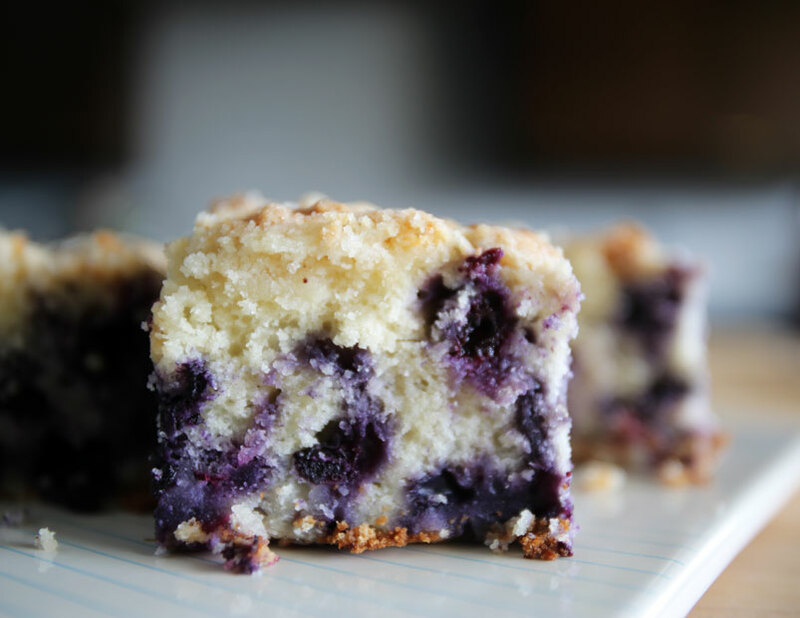 Alton’s Blueberry Buckle Cake is absolutely delicious and easy to make. Thanks for all the tips and for the delicious recipe! Delish! Above 6,000 ft sea level I added 2 Tblsp cake flour. It always turns out perfect! Made it with fresh Oregon blueberries picked in my front yard. I have made it twice and taken to gatherings with resounding success. I omit the topping-too much butter and sugar for me-and serve it wit fat-free vanilla Greek yogurt in place office cream wit a few fresh blueberries for garnish. Alton Brown, you are my hero. Every time I make one of your recipes, it is delicious! Made tonight using AP flour, 2% milk and a metal pan since that’s what I had. Turned out spectacular! Also…first time baking using weight. I LOVED that and will try to never use standard measurements ever again! Made this today. Quick, easy recipe. Directions very easy to follow. The smell while it was baking was unbelievable. We could hardly wait the 30 minutes to cool. Delicious and great. I like the comment someone made to switch out peaches. I’m gonna try that next time. This gets a big YUM! This is equally good with fresh, diced peaches! I have also had lots of luck with the addition of cinnamon and a squeeze of lemon juice.